Hunter Creek Hikeabout | Deso Supply Co.
Deso Legacy Trail Cleanup | Deso Supply Co.
Earth (every) Day Speaker Series | Deso Supply Co.
Wild Lands Film Screening | Deso Supply Co.
10% Off! | All Fired Up! Are You Ready to Up Your Adrenaline? June 15 - 21 Snow or Summer? Opening Day for Lake Tahoe is here! It's 4th of July in Lake Tahoe! 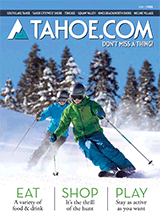 New Tahoe.com Sites Have You Covered!